A lot of people who work in higher education are afraid of Snapchat. If you ask a room full of professional and academic staff to raise their hands if they have been actively avoiding being on Snapchat due to fear, a lot of people will raise their hands. Fortunately, a lot of people who work in higher education are not afraid of Snapchat. 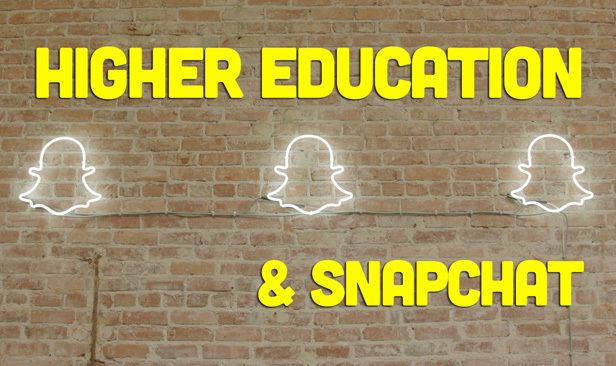 From university marketing to student affairs and beyond, higher education is getting on board with Snapchat as a viable channel for recruitment, brand enhancement, and community building. For a great list of universities on Snapchat, check out this often-updated "Higher Ed Snapchat Directory " post from CASE . The directory lists institutions from North America, Europe, and Australia. After you've installed Snapchat on your phone, it's time to add some "friends." Similar to Facebook, Snapchat lists connections as friends. Connect with as many universities as possible to see what they are posting in their Snapchat Stories. You'll see weekly Snapchat takeovers , current events, a lot of filters/design work, and more. Dave Musson , the strategic social media lead for the University of Warwick, recently spent a month "trying to crack Snapchat stories." In a blog post on LinkedIn, Musson shared his experiences  with crafting daily stories on Snapchat. The best part about his Snapchat journey is that while he initially failed (his words, not mine), he did learn a lot about how to effectively use Snapchat as a channel for storytelling. In many ways, Snapchat in 2016 still feels like Facebook did in 2004. A lot of people who work in higher education have a bias towards the app and think that it's just for young people. Well, when we fast forward from 2004 to today, Facebook is accessed by more than 1.71 billion monthly active users of all ages. Whether or not Snapchat (100 million daily users) will become as widespread as Facebook is yet to be determined. However, it's important not to fear a digital channel. Give Snapchat a try. Figure out how it works and then see if it's applicable as a tool for helping you do what you do for your institution. How is your university/department/area using Snapchat?